Sportsbet run a promotion several times a week on same game multis. This article will show you the technique and the maths to give yourself an advantage over Sportsbet with this offer. The refund offer applies only to 3 or more leg Same Game Multi bets placed on the World Cup Warm-Up International Friendly between Czech Republic & Australia to be played on the 1st of June 2018. It includes bets placed over the Internet or on m.sportsbet.com.au, t.sportsbet.com.au or any Sportsbet.com.au mobile app. With same game multis markets offered include correct score and first goalscorer which can already have margins higher than 30% individually the bookies are loving it if you take these markets combined in multis. This is one of the main reasons that they are happy to offer a promotion on these bets as they make a considerable profit on them. To be eligible, you must place a Same Game Multi of 3 legs or more and only one leg must lose. 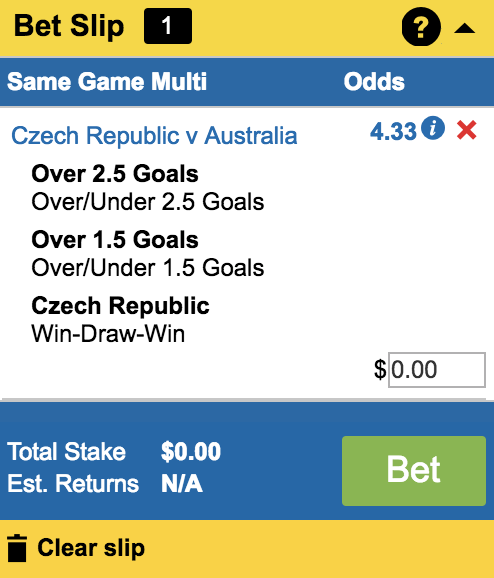 Minimum total odds of the Same Game Multi must be $2.00. Refunds on multis are a common offer. We have guides that explain ho to profit from these here. In general what makes a multi offer better is having a refund offer on multis with less legs involved. A refund on 1 losing leg in a 4+ multi is less valuable than a refund on 1 losing leg in a 3+ multi. The key thing to make these offers valuable is to find markets with odds close to Betfair.